Of the dozens of available web browsers, only Firefox has truly challenged Internet Explorer's dominance. Version 3.5's now arrived, billed as the 'fastest, safest and smartest Firefox yet'. What it isn't, sadly, is an upgrade that befits a 0.5 jump in version number, since the changes are relatively minor. 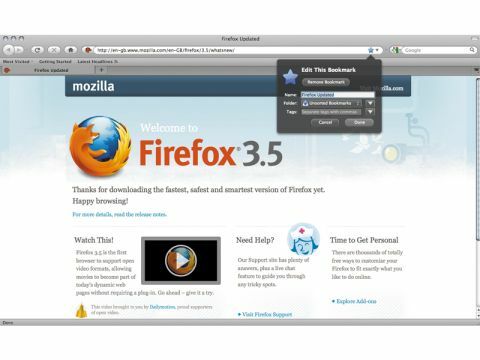 In fact, most Firefox 3.5 updates centre on supporting cutting-edge web technologies. While a laudable goal, uptake from designers isn't likely until Internet Explorer gets on board. For end users, pickings are slimmer; support for Ogg video and audio, private browsing, improved privacy controls, faster performance and location-aware browsing. These features all work well enough, but they don't excite. Luckily, Firefox doesn't break (and often improves) major plusses from the 3.0 release: the 'awesome bar' that easily beats Safari's address bar; bookmark tagging and keyword shortcuts; simple UI reskinning and plug-in support. Unfortunately, Firefox's biggest Mac-related problem remains. It's just not a good Mac OS X citizen, ignoring Mac conventions and technologies, including the built-in system spellchecker and keychain. Even the UI is problematic, looking like a standard Mac app, but not always behaving like one. If these shortcomings were addressed, we'd bestow a MacFormat Choice Award on Firefox. As it is, it's a good browser to install, and great for plug-in fans, but it's still too alien to be a perfect Safari replacement.